Amazon's Choice for "kids movies"
Now you can enjoy all the outrageous fun and laughter of Disney's most legendary comedian as he stars in his very own full-length motion picture! In the great tradition of quality Disney animation, A GOOFY MOVIE is a classic blend of irresistible characters, unforgettable music, and an endearing modern-day story about how the lovable Goof bonds with his teenage son Max on a hilarious cross-country road trip. En route to the ol' fishing hole, they find themselves up to their floppy ears in misadventure! Will Max learn there's nothing wrong with taking after dear old dad ... if he is a little goofy? The question is answered in the showstopping finale when Max and Goofy "crash the stage" at the most spectacular rock concert ever performed! Filled with action-packed scenes, narrow escapes -- even a comic close encounter with Bigfoot -- Disney's critically acclaimed hit comedy is a delightfully memorable adventure your family will love taking again and again!|The film was animated primarily at a new Disney studio in France after character design, art direction, and storyboarding had been completed in Burbank, California.|The nuns who help Goofy sing "Out On The Open Road" appear three other times in the movie: at the diner one of them sticks her head in the picture, at a monster truck show, sitting right behind Goofy and Max, and at the gates of the Powerline Concert. 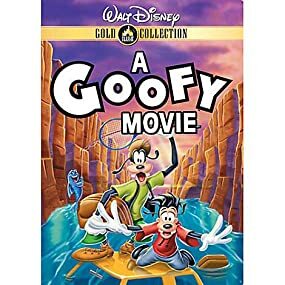 In the great tradition of quality Disney animation, A Goofy Movie is a classic blend of irresistible characters, unforgettable music, and an endearing modern-day story about how the lovable Goof bonds with his teenage son Max on a hilarious cross-country road trip. En route to the ol' fishing hole, they find themselves up to their floppy ears in misadventure! Will Max learn there's nothing wrong with taking after dear old dad ... if he is a little goofy. The question is answered in the showstopping finale when Max and Goofy 'crash the stage' at the most spectacular rock concert ever performed! Filled with action-packed scenes, narrow escapes -- even a comic close encounter with Bigfoot -- it's fun for all ages. 5.0 out of 5 starsI think I love it more than my kids do!! I think that I love this movie more than my kids do!! I find myself singing along with the songs, and The story is very heartwarming. I relate to poor Max and his exasperation at some of his father's goofiness...I remember the days when I was mortified to be seen in public with my Parents!! 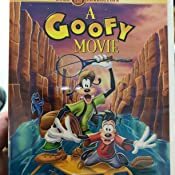 I loved it so much I went out and got the sequel "An extremely Goofy movie" and I was so sad to see that it did not live up to the original...no catchy music!! The music in the first one is the best part!! I was very dissapointed. You will love this movie not only for the Music, but also for the lessons that it teaches your children about family. I have found a favorite for a lifetime!! Always loved this movie as a kid and found a really great price on it for a used DVD copy. Just as good and funny as I remember it! Thank you to Amazon for its great service as always! One of my all-time favourite Disney movies. Great story-line, especially for kids who will one day be teenagers....good for parents too. A real "feel good" movie with action, humour and catchy music. I've shown this movie to lots of children and everyone who has seen it, loved it! I gave my copy away to family members and had to buy another for when kids come over. Loved it as a kid, and revisiting it in my thirties, I still thoroughly enjoyed it. Nostalgia. 5.0 out of 5 starsAnother great Disney Classic!!! Great movie! A kids classic for sure! Disney originals are the best!!! My favorite movie ever made! There's something about this movie that connects so deeply with me and I'm sure many other 90's babies. Only negative is it is now 2017 and there's still no Blu-ray! 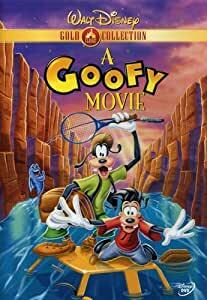 Goofy, Max, a road trip, giant possums, Bigfoot, Powerline, great music... what more could you ask for? !